Master Sgt. Benjamin F. Bitner was born July 4, 1973, in Hagerstown, Md. and was a 1991 graduate of Greencastle Antrim High School in Greencastle, Pa.
Bitner died from wounds sustained from an improvised explosive device (IED). 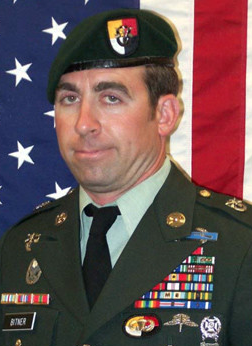 Bitner enlisted in the U.S. Army in 1991 and attended Special Forces Assessment and Selection in 1999. Later that year he graduated from the Special Forces Qualification Course as an engineer sergeant. He joined C Company, 2nd Battalion, 3rd Special Forces Group (Airborne), headquartered at Fort Bragg, N.C., in 2003. He deployed in support of various operations across the globe, including but not limited to: Operation Flintlock, Africa, 2001; Operation Nectar Bend, Africa, 2004; Task Force Falcon in support of operations in Kosovo, 2001 – 2002; Operation Desert Spring, Kuwait, 2002; Operation Iraqi Freedom and four deployments to Afghanistan (Operation Enduring Freedom) with Company C.
His military education includes: Track Vehicle Repairers Course, Single Channel Ground Airborne Radio Systems Operator Course, Basic Infantry Course, Basic Airborne Course, Long Range Surveillance Leader’s Course, Warriors Leader Course, Special Forces Engineer Sergeant’s Course, Basic Non-commissioned Officer’s Course, Advanced Non-commissioned Officer’s Course, Survival Evasion Resistance and Escape Course, Special Forces Advanced Urban Combat Course, Special Forces Sniper Course, Special Forces Advanced Reconnaissance Target Analysis and Exploitation Technique’s Course, Special Forces Master Breacher’s Course, Special Forces Intelligence Sergeant’s Course, Military Free-Fall Course, both Summer and Winter Basic Mountain Warfare Courses and the United States Army Special Operations Command Mountaineering Master Trainer’s Course. Bitner’s military awards and decorations include six Bronze Star Medals, Purple Heart; two Meritorious Service Medals, three Army Commendation Medals with “V” device, three Army Achievement Medals, four Army Good Conduct Medals, three Army Reserve Components Achievement Medals, two National Defense Service Medals, Kosovo Campaign Medal, Armed Forces Expeditionary Medal, four Afghanistan Campaign Medals, two Iraq Campaign Medals, Global War on Terrorism Expeditionary Medal; Global War on Terror Service Medal; three Non-commissioned Officers Professional Development Ribbon, Army Service Ribbon; four NATO Medal, Special Forces Tab, Combat Infantryman’s Badge, Parachutists Badge, Military Free-Fall Badge. Bitner is survived by wife April, sons Gunnar and Rogue; and parents Roger and Beverly Bitner of Greencastle, Pa.